Agile digital transformation is based on evidence that successful digital transformations occur through continuous innovation – by radically changing business models and capabilities in measured steps, over time, and as resources allow. This empowers organizations to launch, learn, and re-launch digital initiatives, swiftly reacting to changing market conditions and customer needs. According to a recent Gartner survey, 63% of business leaders indicated they don't really know the possibilities of next-generation technology. Not surprisingly, just 13% of respondents said they have identified the next major digital business technology investment. The reason for this is simple. The company lacks a transformation vision that will map out digital strategy and, more importantly, give the business the ability to measure progress and make real-time adjustments to improve outcome. Senior management must create, articulate, and communicate the compelling future digital vision. Transformation does not occur bottom-up. In the late 20th century, marketers made products and services available through digital channels. Today, product portfolios are becoming apps. Customer expectations, swayed by digital innovations, stress legacy models as customers rarely accept an experience that is good enough, causing business models to transform to deliver exciting and personalized customer experiences and to maintain engagement. The music industry transformed when it responded to what customers really wanted – ongoing access to their favorite music united with perspectives from friends, critics, and the musicians themselves – through a business model that disrupted the limitations of a physical world. Digital technology is built around the front-end customer experience – unlike marketing initiatives of the past that were more back-office marketing automation and Customer Relationship Management (CRM) focused. Technologies and techniques cannot be purchased off the shelf as an integrated package. Instead, there are sets of applications and emerging platform tools that create value by enabling a digital ecosystem that automates the customer experience through social, data, cloud, and mobile. Exposure to new growth opportunities – not by adding digital features to existing products, but by changing direction and considering how products and services adapt to the digital customer. "Kaiser Permanente implemented its digital health platform to enable clinicians and its 9 million members real-time access to medical information. This digital platform empowered the company to service its clients via mobile apps, self-managed services, and virtual consultations, along with storage of biometric consumer device data." When using our mobile devices and tablets, we rarely consider the underlying infrastructure that enables our digital experience. In the corporate environment, Enterprise Resource Planning systems have molded and dictated the application landscape for more than 20 years, resulting in monolithic structure, high cost, and limited flexibility. Over the past few years, the Cloud has begun freeing up the application landscape, wrestling control away from the handful of dominant traditional development vendors. Today's applications originate from a variety of new sources including online catalogs and exchanges. Seemingly the entire world can now be considered part of a company's IT organization. In this environment, platforms are the dominant innovation channel. Some of the best innovation in today's marketplace is happening outside of the company's four walls, limiting the need for the expansive research and development teams of yesterday. These powerful digital platforms feature open Application Program Interfaces (APIs), open datasets, service catalogs, integration frameworks, solution guidance, and collaboration tools enabling a business to quickly create their own market based on customer-focused solutions leveraging enterprise grade information and services. With limitless technology partners, digital platforms allow for intelligent use of Cloud, Big Data, social media, smart "Things", and mobile devices. Leading organizations are implementing, in gradual phases, digital platforms to bridge the steady and predictable world of enterprise systems with the agile, opportunistic landscape of digital transformation. Digital platforms let business owners, partners, and even consumers rapidly create next-gen solutions based on market or customer change. While next-gen solutions and digital platforms have opened a host of new, low cost, dynamic solutions, they have also introduced a Pandora's Box of next-gen risk. The digital world is one of extreme connectivity and open architecture. This has challenged IT departments in keeping up with security and risk management solutions. The clash lies in the inherent slowness of back-end IT compliance versus the swiftness and agility of digital platforms. However, hiding behind an impenetrable firewall is a digital innovation killer, so these new risks must be managed. Organizations must prioritize risks germane to their specific operation. With the hottest application today being security, they must manage risk using smart tools to quickly detect intrusions and respond in real time. Secure interfaces to digital platform components are the key to liberating existing IT assets and enabling digital innovation and growth. While security of assets and data is paramount, the right strategy will support the speed, safety, and growth required in today's digital economy. Progressive digital organizations not only constantly gather data but connect and visualize that data in a context that generates insights that can be acted upon. 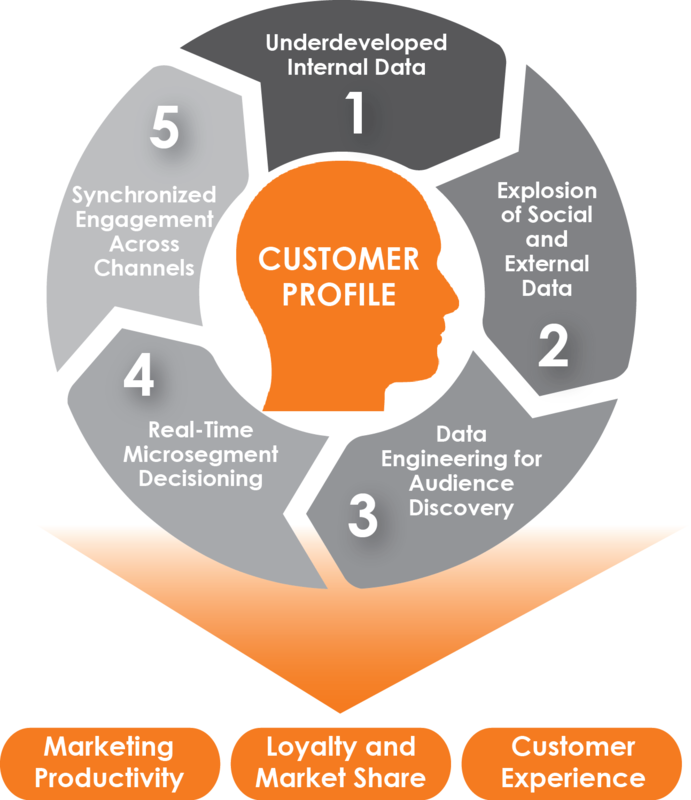 The key to unlocking real-time data intelligence for dynamic and unified customer engagement is understanding and addressing customer personas and micro segments. Traditionally companies have a reasonably strong foundation of sales transactional data. However, this data often lacks the necessary dimensionality to create meaningful demographic, attitudinal, and predictive insights. In addition, data rarely is augmented by leveraging publically available and purchased data. 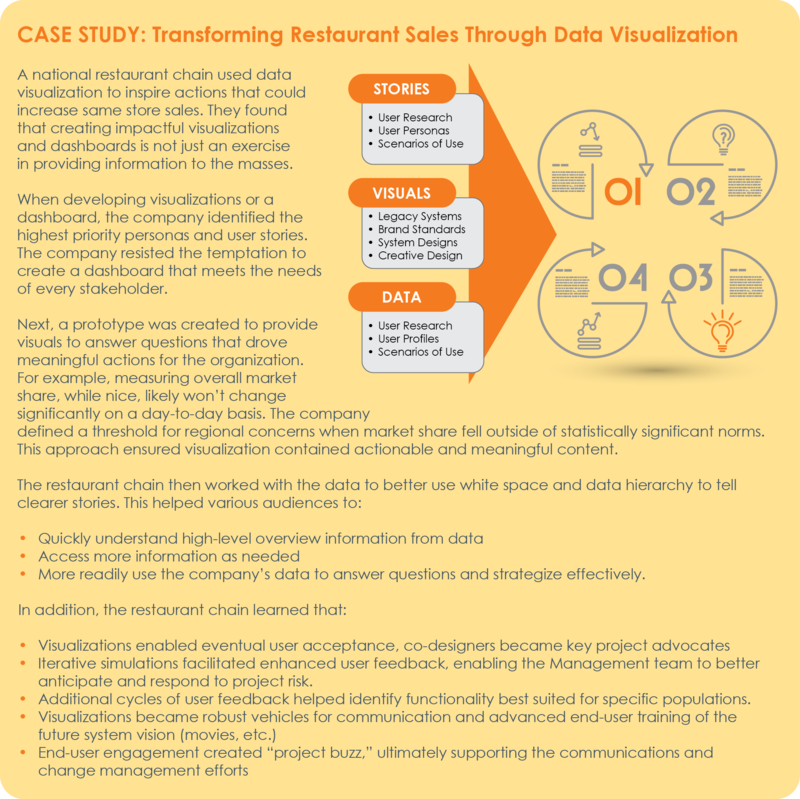 Many organizations are using data visualization to communicate information clearly and efficiently to users through statistical graphics, plots, infographics, and dynamic tables and charts. Effective visualization helps users in analyzing and reasoning data and evidence. Data visualization makes complex data more accessible, understandable and usable. It accelerates a stakeholder and executive's understanding and decision-making around technologies and capabilities, reducing rework and, ultimately, application development costs. Business leaders often struggle to execute expansive projects due to constantly changing market and customer conditions. The traditional business model features disconnected, non-integrated platforms by business function and projects with 6-18 month lifecycles. Quite often, by the time the project is completed, market and customer requirements have changed with success criteria and ROI seldom realized. To avoid these pitfalls, companies must embrace adaptable differentiation by developing a "digital agility advantage" that allows a company to embrace market and operational changes as a matter of routine through the use of digital technologies. Digital agility initiatives are rooted in 30-day sprints with new iterations built better and faster. This allows an organization to consistently experiment and adjust – the concept of learn, launch, re-learn, re-launch – refining the approach in manageable iterations. Successful firms in the digital age must demonstrate an awareness of how to be agile. Then, they must be able to execute in an agile way – including how they manage innovation and governance. Digital agility supports digital innovation in empowering a company to continuously evolve digital strategy based on prior outcomes and program feedback. Best practice companies typically assess their digital maturity across capabilities while exploring innovative options to drive radical growth for their business. A digital innovation framework is essential for successful transformation management. Digital governance presents a challenge in that there are numerous internal and external partners involved as well as numerous platforms, frameworks, and designs. To further complicate matters, the work may be deployed globally, making geographic management and risk mitigation a challenge. Most common is centralized coordination of digital programs. This governance structure outperforms silo, hub, and global organizational mechanisms. Coupled with a monitoring program through key performance indicators and scorecards, radical organizational change can be achieved. To return to the Digital Transformation whitepaper homepage click here.